the thrum of the harp, clear song of the scop. Most scops performed before groups. 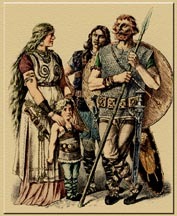 Many performed in the great halls of chieftains and kings. Some noblemen may have employed their own house scops. Other scops may have traveled from court to court. 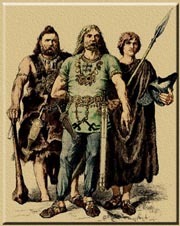 Some chieftains and kings are reported to have cultivated the performance skills of the scop to enhance their public personas. The tones of the harp were probably used to mark emphatic alliterative syllables while the scop gave his performance in delivery style that was somewhere between speaking and singing. 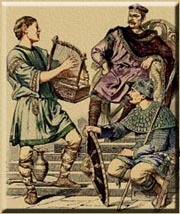 The "music" of the harp was present to enhance the rhythmic qualities of the text, not as a pleasing melody. The scop performed heroic lays and heroic epics. These narratives moved swiftly to their conclusions, and centered on the deeds of a few men who acted out their fates with their own sense of justice, regardless of the consequences to themselves and others. Anglo Saxon chieftains gave rings of gold and other precious metals so frequently that the poetical name for chief was beag-gifa, or ring-giver. These "rings" might come as an adornment for the finger (as we would assume today) or in the form of bracelets, arm-rings, or collars. The performance of a skilled scop was so highly valued that there are several mentions from 5th through 10th century literature of kings and queens giving land grants to deserving poets. The scop was not merely an amusing performer, but a powerful member of the community in command of potent tools for shaping public opinion.